The critically acclaimed release of Pirates, Vikings, and Knights shook the earth to its very core and changed the face of gaming forever. Yet, despite its unique game play and innovative features, it never became popular amongst the masses, who instead clamored to other genres such as the archetypical realistic shooter. But still there remained a small but vocal crowd of supporters who kept the game alive for year after year, long after development on the original PVK seized. It was from this strong community that the idea of a new and improved PVK being arose. Enter the exciting world of Pirates, Vikings, and Knights II - The only sequel to bring you these three unique trimetricly opposed teams in continuum! If you haven't already done so, download the client installer at the Pirates, Vikings and Knights II Game Files page. To install PVKII you will need 3 things. If you have these three things, open the PVKII Installer and install the game into your SteamApps\SourceMods folder (the installer should find the folder automatically. Once this is done the game should be installed, exit out of steam and restart it to see PVKII in your 'Games' tab. You will now need to find a server to play on. Run Pirates, Vikings and Knights II by either opening the game through your 'Games' tab in Steam or through the desktop shortcut. Click on "Find a Server" from the main menu. A menu listing all PVKII servers that have bypassed your filters will pop up. Find a server with the lowest ping that has people playing on, and click "Join Game". Upon joining a server you will see the Message Of The Day screen. Read this carefully, as many server operators explain their rules to abide by there. After the MOTD screen, you will have the opportunity to select a team. Obviously, choose to be a pirate, a viking, or a knight. You can look at the scoreboard ('Tab' by Default) to see which team is lowest on players. You may also choose Auto Assign if you can't decide what team to play! After selecting a team you will have your choice of which class to play as on that team. Currently each team has 2 classes each so remember to change it up a bit to see what you like best! Thats its! If all has went well you have spawned now, and are ready to do some serious fragging. Go look for an enemy and stick a sword in em. For more in-depth information on objectives, see Section 4. Game Modes. For more information about sticking swords in people see Section 3. Combat. The current amount of health you have. The current amount of armor you have. The special attack bar rises whenever you damage an enemy. Once full, the eye will light up and will now have the oportunity to use a special attack, which differs depending on which class you are. See Section 5. Classes for descriptions of all special attacks available. On some maps, a round counter may appear. This counter expresses how close each team is to winning the round. The first team to reach zero wins. By default, use the scroll wheel to see the weapon selection panel. Scroll through the weapons to find the one you want. On the lower right is the ammunition counter. This can be crossbow bolts, longbow arrows, throwing axes, blunderbuss shot or pistols. 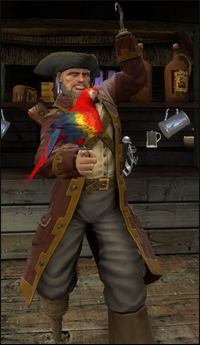 For the flintlock pistol, there are two icons- One of them represents how many pistols you have loaded. The other is how many bullets you have for reloading. This meter represents the power of your weapon. You can charge your melee and ranged attacks to do more damage. Be careful when a using melee weapon, if held for too long the bar will go back down and your attack won't be at full power. Melee - Hold your attack button (Default Mouse1) to charge your attack, release the button to swing. 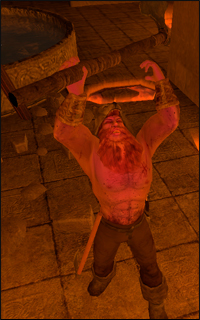 Attacking with a melee weapon can be done in one of four directions. Choosing a direction to swing corresponds to your movement when first charging the attack. Moving left swings Right -> Left, moving right swings Left -> Right, forward is an Overhead chop and moving backwards is a stab. Hit detection now takes into account the weapon's arc. With a big enough arc (most two-handed weapons) it is possible to hit multiple opponents if they're close enough together. Hitting an opponent with a 100% charged attack will push the enemy back if they're blocking in the wrong direction. 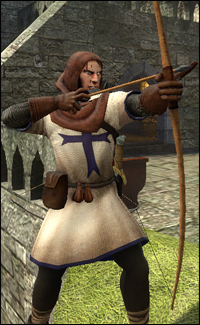 Ranged - When using the throwing axes or longbow you need to charge the weapon fully for maximum damage and distance. Keeping in mind when aiming at distant targets the arc of the projectile as well as the time it will take to get there especially if your opponent is moving. Pistols are more accurate when standing still and the blunderbuss has a limited range due to shot spread, the closer the opponent the more damage it will do. Special Attacks - Keep an eye on your special meter. It will slowly fill as you do damage to your oponents. When full you may use your special by hitting your special button (Default Mouse3). Not all weapons have a special, check Section 5. Classes for more info. Parrying - You can parry with any melee weapon (Default Mouse2) in one of four directions. 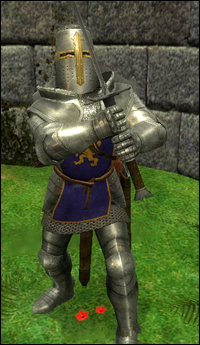 The direction of your movement when using the block button will decide which direction you will parry. Achieve a 'Perfect Parry' by parrying in the correct direction of the opponent's attack. Shield Blocks - Shields can be used to block (Default Mouse2) both ranged and melee. While blocking, the player may hit their attack button to bash the enemy with their shield. Counter Attacking - After a 'Perfect Parry' the player can hit their attack button to do a quick counter attack. The opponent will be stunned and unable to block. Weapon Sizes - The size of your weapon vs. your opponents weapon will decide how well you can parry. Small weapons cannot 'Perfect Parry' large ones, but will reduce the damage taken when performing a successful parry. Chests in the knights base in Island must now be kept in their spawning points. 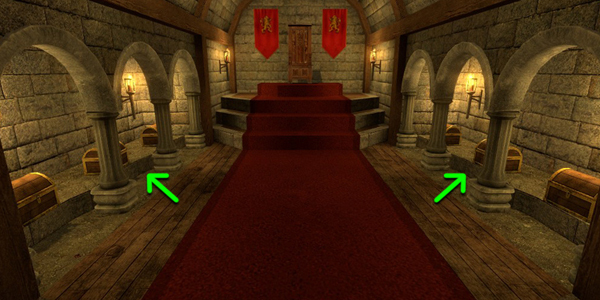 Chests in the hall and back of the throne room will no longer be scored. The counter appears in many game modes. Reach zero to win. The simplest game mode of them all - Kill everyone you see who is not on your team. The team with the highest number of frags at the end of the round wins. The objective of booty mode is to infiltrate the enemy bases and bring back as many chests as you can to your own base. Every chest at your base will lower the counter. The first team to reach zero on this counter wins the round. On some maps, a particular team may start with all of the chests with the objective of defending them from the other teams who have no chests. To compensate for the advantage, the team will have a much higher counter, and thus need to hold the chests for a longer period of time to win. In other maps there may be chests in areas of the map outside of team zones. 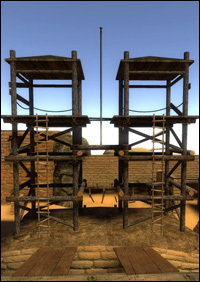 The effective team must strike a balance between offense and defense, for if everyone is on offense, an enemy may steal chests from the base while no one is there. Should everyone be concentrated on defense, there is no possibility of obtaining more chests. Like "king of the hill", the objective of territory mode is to reach a particular place (the territory) and remain there for as long as possible. As your team holds the territory, the counter will go down. The counter will go down faster as more players control it at the same time. The first team to reach zero wins. This is an interesting game mode as it will change depending on the map. Mappers have free reaign to make anything an objective as long as it has an input/output ability. The designated team that defends must hold out till the timer hits zero, the designated attackers must complete the objectives before the timer reaches zero. If you're a mapper, check here for a quick guide. Somewhere in the map is the holiest of grails. You must find this unique item and take it from whoever (or whatever) currently holds it. While holding the grail youa nd your teammates will be buffed by its holy power and must slay a designated amount of teammates to win the round, while holding the grail of course. The name is pretty self explanatory. Kill all your opponents by the time the timer runs down and you win the round. If the timer hits zero, Sudden Death begins and there's no telling what might happen! The scurvy-infested dogs of any pirate crew. They may be weak, but they are fast. Fast, despite having a powderkeg strapped to their back. When outnumbered, a common tactic is to use the powder keg as a sort of suicde bomb- Running directly into a large group of enemies with the keg lit. Your standard pirate sword. The cutlass is not as powerful as other weapons, but it is light and quick. 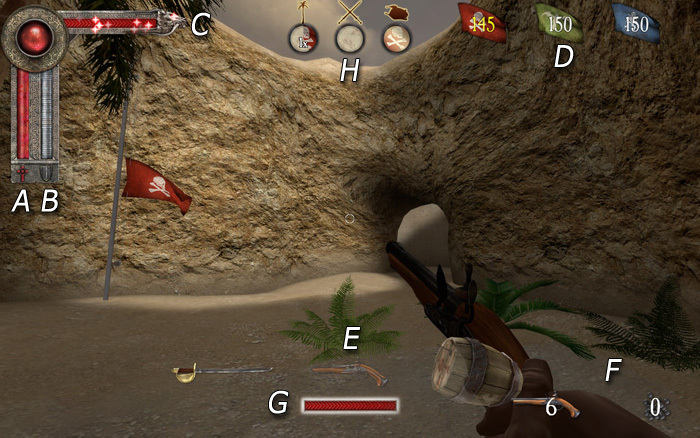 Because of their slow reloading time, many pirates carry six loaded pistols which can be fired relatively quickly. Once spent, the pirate will need to find a safe spot to reload them. Note that there are actually two "ammo" counts for the pistol- One for the number of pistols currently loaded, and another for the number of pistol rounds you currently have. A keg full of highly explosive black powder. The keg can be lit by the Mouse1 button. Once lit, pressing Mouse1 again will toss the keg. 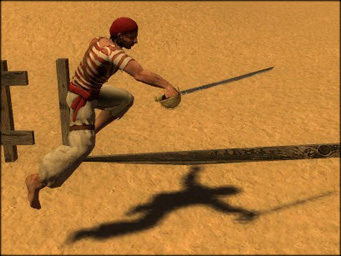 When wielding the cutlass, press the special attack button to perform a lunge. Don't let the peg leg fool you. Captains are as deadly as their crew and as thirsty for booty as the next pirate. Armed with their parrot companion, these guys don't go down without a fight. More powerful than your average cutlass, the captain knows how to use it to take down even the strongest of opponents. Although it only holds one shot, the captain comes equipped with backup ammo and has master the art of reloading with a hook. These shotgun-esque weapons are deadly up-close and come with your standard warranty. If not completely satisfied, there's always the parrot! This parrot was trained to peck and makes for an excellent diversion. When in desperate close-quarters combat (Or looking to embarass your opponent) the hook may also be used to gouge and punch. Be sure your blunderbuss is loaded and be ready to unleash an exploding ranged shot. Berserkers are legendary Norse warriors known for their ferosity in battle and ability to go into an extreme state of rage. Some say they eat mushrooms to induce this rage. Others say they have a special spirtual bond with the gods, who grant them this gift. We, however, say they just get really pissed off. Swung in quick succession, this deadly combo is quick enough to mow grass as well as flesh. Slower than the other weapons, but just as deadly. These axes are capable of splitting a mans skull in half. Use the special attack button to go into a berserker rage. While in this state, you gain strength, speed, health, and the uncanny desire to howl like a wolf. But beware, for after the rage has ended, the gained health will be lost- possibly killing the berserker in the process. A moderately armored viking with ranged capabilities and a shield to guard against the attacks of all opponents. The Huscarl may not be as crazy as the Berserker, but maybe that's a good thing. What lunatic goes into combat shirtless anyway! Faster than most two-handed weapons, this axe can quickly take down lightly armored veterans and noobs alike. Nothing stops a ranged assault better than a warriors shield. Besure to use during melee situations as well, a well timed bash can really mess up your opponent's vision. 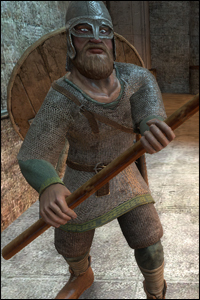 What do you call a Viking with throwing axes? Deadly. These babies will have your enemies running in fear, unfortunately for them the axes are faster (don't forget about gravity when throwing long distances). With your Sword & Shield out and your meter full, use your special attack function to initiate a powerful shield charge that will leave your opponents dazed and confused. Oh, they sometimes go into flight as well. Like a medieval version of a tank, these elite troops are capable of withstanding a tremendous amount of damage and can dish out almost the same. A really long sword. Is he making up for something? We think not. I wouldn't ask either, the sword hurts enough when he isn't angry! The shield can be used to bash enemies, temporarily stunning them. Use this time to wack them with the sword. With the two-handed sword, use the special attack button to perform a wide round swing which will damage everyone in the area. The Crème de Cacao (Chocolate Bean?) of the Knight's Arsenal. These guys may not be the burliest of men, but they know how to make killing look good. A small but quick sword to be used only when absolutely necessary. Archers hate getting bloody! The Archer's calling card. Let's see a pirate chase you down with an arrow in his good eye. Use the advanced crosshair to your advantage when judging the arc gravity will have on your arrows! When you have the proper ammo to do so, use this special to fire 3 arrows. Hold the button down to keep from prematurely discharging! Look around the map for various meat assortments to restore your health. Team-Specific Armor and Ammo is strategically placed throughout each map. 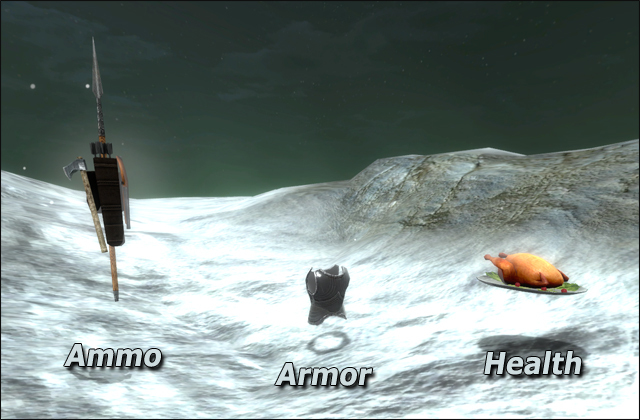 Armor is important for absorbing damage and ranged weapons don't work without ammo! Food, Armor and Ammo that your team can use will be sparkling. Website design by Bob Speirs, Logo by John Ross and images courtesy of Pirates, Vikings and Knights II. © 2008 www.pvkii.com All Rights Reserved.